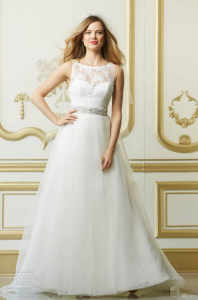 This plain appearance of this sheer sweetheart neck wedding dress is what attracts not to mention the unique cut of course! The neckline is revealing but at the same time covered with a lacey flap across the shoulders and ending just at the waist. The double folded bottom of the gown with slight frills looks charming on the bride and makes her look special for the special day. In addition, the dress consists of white floral patterns at the top to add a grain of sophistication to the dress. It definitely compliments your slender figure like never before.